The Russell Forum for Civic Life in Georgia hosted its monthly informal forum on Friday, February 19, 2010 at 3 p.m. at the Russell Library on the UGA Campus. 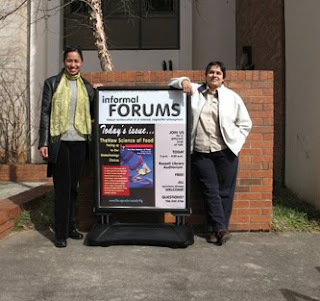 A group of students, faculty, and staff from the University of Georgia, as well as some members of the Athens community, gathered to deliberate the challenging topic of food safety and related issues using the National Issues Forums guide, The New Science of Food: Facing up to Our Biotechnology Choices published in 2003. With the Georgia Organics conference happening at a nearby venue in Athens, it seemed like a great time to take up this challenging issue. To begin, forum participants shared some general experiences and perspectives related to buying, growing, and eating food today in the U. S. Although almost everyone in the group said they paid some attention to the nutritional information labels on packaged food, most also expressed concern that the labels were often hard to interpret. One person raised the example of “natural flavorings” as an ingredient listing that appears in many processed food labels. He explained that natural flavorings in strawberry yogurt often include ground up bug bodies that provided coloring to the product and that, really “natural” as a descriptor was meaningless. Another participant also noted that the food labels don’t address how the food was produced and where it was produced—factors that can have a huge influence over the cost, safety and environmental impact of a given product. The lack of clear labeling of food served to amplify forum participants’ concerns that much of the mainstream food supply contains a startling array of chemicals and unhealthy ingredients. There was strong consensus among participants that with the rise of allergies to peanuts and other foods, clear informative labels are essential. One forum attendee also expressed particular anger over the television commercials in favor of using high fructose corn syrup. Another participant reminded the group that the notion of biotech foods is not a new concept and in fact farmers and the food industry has been employing chemicals and technology to improve crop yields and extend the shelf life on food for many years. He also pointed out that at the same time, organic approaches to food production are also not new ideas. There was a general consensus that awareness of food safety and issues related to overall sustainability are becoming a growing concern in many American communities. At the same time, with the economic decline in recent years, many people find purchasing organic food—which typically costs more than regular food—challenging to afford. The forum participants agreed that economics on micro and macro levels would determine food choices for Americans and, in fact, people around the world in the years to come as costs of production rise in relation to the cost of petroleum. According to one participant, low fuel prices and government subsidies enable Americans to afford produce out of season that is trucked in from all over the world. If these costs rise, then people may find organic or locally grown food affordable in comparison. Another factor that influences American eating habits tremendously is advertising sponsored by the food and restaurant industries that emphasize cheapness, quickness, and convenience to an American audience that perceives itself to be overworked, strapped for cash, and too tired to cook. The group moved from this overview of perspectives on food to consider each of the three approaches outlined in the issue guide. Click HERE to read the group’s deliberation of each approach and its closing thoughts.